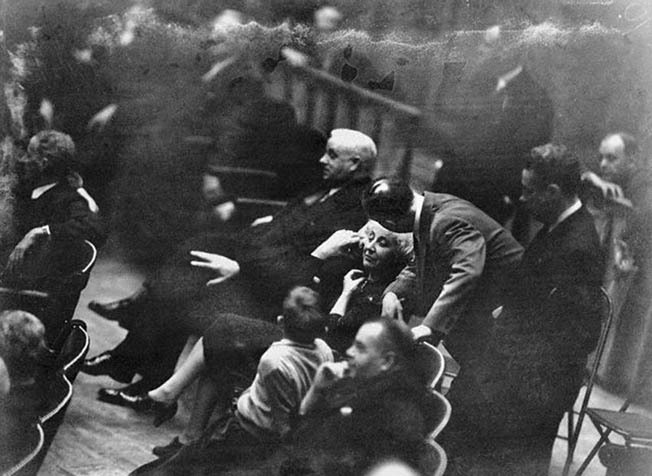 Congresswoman Jeannette Rankin cast the only vote against declaring war on Japan the day after the Pearl Harbor Attack. An Associated Press report described “a chorus of hisses and boos” that echoed through the chamber when the Congresswoman from Montana cast her vote. It was Monday, December 8, 1941, and the U.S. House of Representatives was assembled to ratify the declaration of war that President Roosevelt had asked for earlier in the day. Just 24 hours before, an aircraft carrier task force of the Japanese Imperial Navy carried out an air raid on American military installations across the island of Oahu in the Territory of Hawaii and left the U.S. Pacific Fleet in a shambles. Although a troubling diplomatic confrontation had been unfolding for over a year between the two nations, Japan and the United States were at peace with one another at the time of the attack. 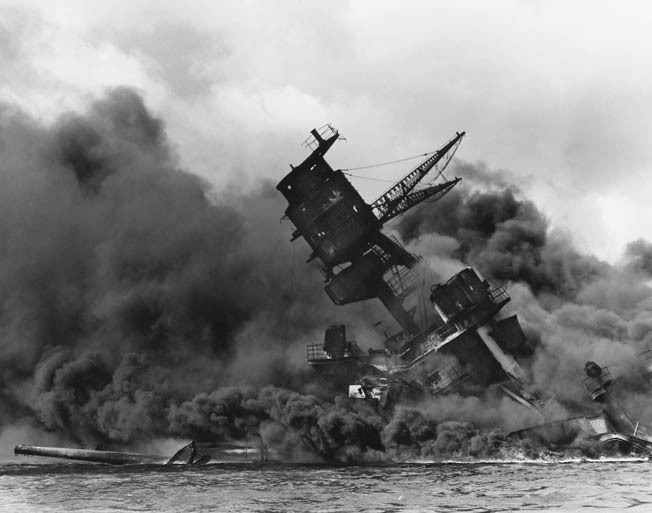 With almost 200 U.S. aircraft destroyed, the Pacific Fleet smoldering or sunk at Pearl Harbor, and 2,400 Americans killed, a national consensus had been born overnight demanding war with the Japanese. When the measure went to a vote in the Senate in the early afternoon, it passed unanimously, 82 to 0. But when it went before the House of Representatives shortly thereafter, not everyone answered “aye” when the Speaker asked for those in favor. 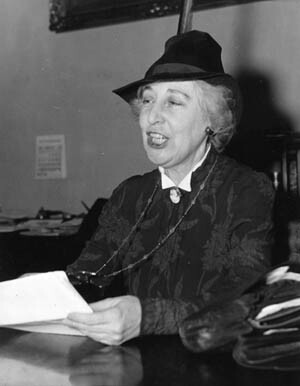 The hisses and boos came only when 61-year-old Jeannette Pickering Rankin replied with a “nay”––the only opposing vote cast in Congress that day. But it was not the first time that Representative Rankin had opposed a declaration of war. On April 5, 1917, the Washington Times reported that she appeared to be “a woman on the verge of a nervous breakdown” as she stood to answer the roll call vote in the House of Representatives. No ordinary matter, this vote would decide the question of American intervention in World War I. For 37-year-old Representative Jeannette Rankin, this important moment had come swiftly after her official swearing-in just three days earlier. The other members of the 65th Congress “cheered and rose” when her name had been called on that historic day because it marked the first time a woman entered the membership of the United States Congress. In the final tally, the measure passed in the House 374 to 50 and the United States entered the “Great War.” Although Jeanette Rankin’s first vote in Congress did not avert America’s entry into the conflict, it did make her a household name and introduce her unique blend of pacifism and feminism to a nation still suspicious of both beliefs. During the 25 years that followed her vote against the declaration of war in 1917, Jeannette Rankin left Congress but continued her crusade of radical antiwar and social reform activism. Her boundless, unwavering energy and epic stubbornness brought her into conflict with the leadership of every organization she served, making her a political outcast even among the suffragists of feminism’s first wave. In 1940 she reentered Congress and eventually voted against America’s entry into World War II in a move that made her irretrievably unpopular. After choosing not to run for reelection in 1942, Rankin withdrew from public life, only to emerge again during the 1960s to protest U.S. military involvement in Vietnam. A lifelong dedicated pacifist and the first woman elected to Congress, Montana Representative Jeanette Rankin cast one of 50 votes against the U.S. entering World War I—and the only vote against World War II. Her crusading, therefore, also reached into feminism’s second wave at the end of over 50 years of political activity. During that half century, gender was both a blessing and a curse for Jeannette Rankin. It provided her the opportunity to serve in the House of Representatives at a time when women could not vote, but it also provided the limits that restricted her political career. Jeannette Pickering Rankin’s life began in June 1880 on a ranch just outside Missoula in the Montana Territory. Her father’s business success in ranching and building charted the course of her future in so far as it provided her with not just a comfortable lifestyle, but also the financial support that would ultimately allow her to pursue her interest in social reform. Whereas most young women in rural Montana at the turn of the 20th century married early and started families, the trajectory of Jeannette Rankin’s life took her instead to college and to a brief career in teaching. Then, in 1908, she moved to New York City and entered a Master’s degree program in social work at the New York School of Philanthropy. After experiencing the urban realities of child welfare in a major U.S. metropolis, Rankin’s social progressivism began to explore new methods of childhood development and character building among orphans as well as cultivating higher standards of motherhood. When she returned to the Pacific Northwest the following year, Rankin continued her education by studying public speaking, sociology, and economics at the University of Washington. 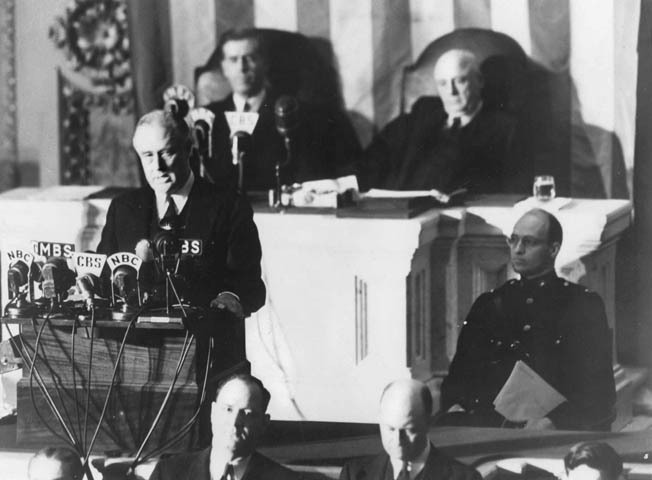 President Franklin D. Roosevelt asks a joint session of Congress to declare war on Japan, December 8, 1941. The House of Representatives voted for war, 388 to 1; the Senate was unanimous. During this same time her only brother, Wellington D. Rankin, received an education that placed him on an altogether different career path. He attended Harvard University School of Law, became a successful trial lawyer and ultimately U.S. District Attorney, Attorney General of the State of Montana, and Associate Justice of the Montana Supreme Court. In addition, Wellington Rankin also took over his father’s business interests when he died in 1904, serving as the executor of his estate. Despite the fact that she was the first born, it does not appear that Jeannette or anyone in the family expected her to take over the Rankin economic empire. Clearly, the male heir (Wellington) would be the one to develop the necessary skills to manage the family assets, and so off he went to Cambridge, Massachusetts. Brother and sister followed separate, gendered paths in education, with Wellington learning how to be a business leader and Jeannette learning to be a school teacher and exploring the social reform ideologies embraced by so many of the women active during the Progressive Era. After spending a year as a social worker in Missoula, Spokane, and Seattle, Jeannette Rankin changed paths again and turned her attentions to the movement that was sweeping the nation: women’s suffrage. Beginning in 1910, she began five years of campaigning and grass-roots organizing in the movement as a field secretary for the National American Woman Suffrage Association. 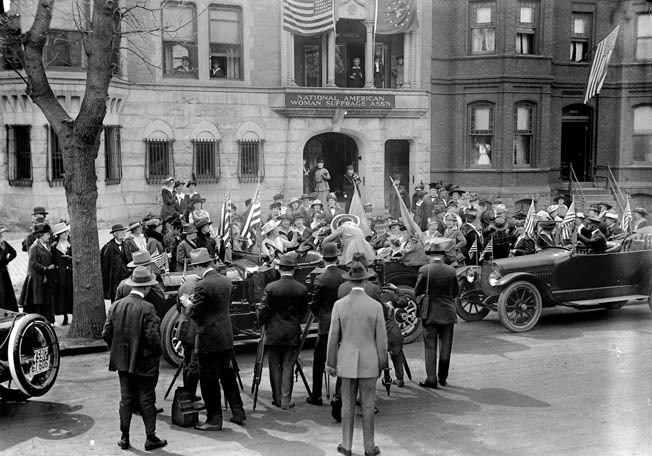 Although the campaign took her from coast to coast, she directed the effort in Montana and in 1914 succeeded in making it the 11th state to pass woman suffrage. Her distinctive speaking style and fervent eloquence helped the cause and made Jeannette Rankin a rising star in the movement. The American people were isolationist and firmly against involvement in foreign affairs—until the surprise Japanese attack on Pearl Harbor. Her passionate oratory and untiring efforts won many admirers across the country. One suffrage organizer in New York described how “her tact, her gentle feminine persuasion and her ever-ready logic made many converts to Woman Suffrage” there. During 20 weeks of “the most strenuous” fieldwork, Rankin demonstrated herself to be an “unselfish volunteer” and did it all for expenses only. But the accolade and admiration of suffragists throughout the United States would not last forever. A series of circumstances unique to Jeannette Rankin—and unique to Montana—made this victory possible. First, she possessed all of the qualities of an excellent candidate and she belonged to a wealthy and influential family that could provide the financial backing and the networking necessary to win a Congressional campaign. She also ran in a state where she could actually win. In the less populated Western states, women in politics became a reality sooner than back East. This was certainly true in Montana where conservatives worried that the increasing influence of an expanding immigrant population would overshadow the interests of a white minority. Enfranchising the state’s women served the pragmatic political purpose of doubling the size of the white electorate with the stroke of a pen. When Jeannette Rankin ran for the House, she ran as a Republican candidate and, unsurprisingly, attracted the state’s female voters. In a perfect example of principle meets pragmatism, she was the right person at the right place at the right time. Her gender had opened the door of opportunity and she had walked through that door into the House of Representatives on behalf of women everywhere. Fellow suffragettes gather around a car carrying Jeanette Rankin, who was already a controversial figure, during a 1917 rally. The cold shoulder that turned toward Jeannette Rankin immediately after the April 1917 vote on the declaration of war against Germany only foreshadowed the more ominous opposition that she would confront the following year. The suffragists who had supported her run for the House of Representatives in 1916 withdrew their support in 1918 when Rankin made her next political move. Earlier that year the State of Montana eliminated its at-large House seat and created in its place eastern and western congressional districts. Rather than competing against a colleague for the western district seat or carpetbagging in the eastern district, Rankin decided to make a run for the Senate. An unidentified Congressional colleague tries to persuade Rankin to vote for a declaration of war on Japan, December 8, 1941. She refused. In response to news of this decision, Carrie Catt told the Helena Independent that, “for her sake as well as ours it is most advisable that she should quit at this stage.” To pour salt in the wound, Catt offered nothing but the kindest words for Rankin’s opponent, Democratic incumbent Thomas Walsh. In the end, opposition to the declaration of war, as well the perception that she held sympathies for radical labor activists in Butte, turned the voters against Rankin and she lost her bid for a Senate seat. Throughout her life Jeannette Rankin continued to work in the interests of pacifism and social welfare after leaving the House of Representatives, and her words continued to echo with the radical timber for which she was famous. As a paid lobbyist, she became an advocate for child-labor reform, hunger relief, consumer protection, minimum wage/maximum hour legislation, and even a Constitutional amendment outlawing war. Tags air raid, Aircraft carrier, American, attack on pearl harbor, CIA, general, German, Germany, Hawaii, Imperial Germany, Interviews, Japan, Japanese, japanese attack on pearl harbor, Japanese Imperial Navy, Jeannette Rankin, military, Monitor, navy, New York, Oahu, OSS, Pacific, Pacific Fleet, Pearl Harbor, Tern, The Pacific, Tory, Troy, Tula, United States, us military, Vietnam, WIN, World War I.